Wood crafts can be used to produce small objects, such as bird feeders, flower boxes, and paper towel holders, or larger items, such as nightstands, cabinets, bookcases, or stools. Online sources provide catalogs of free patterns for such crafts with a range of project difficulty. Country Corner Crafts' website (www.countrycornercrafts.com) has patterns for small decorative signs and other outdoor items that can be good for beginners. Most of these pieces are made of plywood and require basic band saw or saber saw and drill knowledge to cut pieces and drill small holes. All Crafts and Amateur Woodworker have websites (www.allcrafts.net and www.am-wood.com) that have selections of medium sized and medium difficulty projects. Decorative woodworking projects and functional household projects such as paper towel racks, jewelry boxes, and television stands are available. Most projects are made of sturdy wood, such as oak, ash or pine. 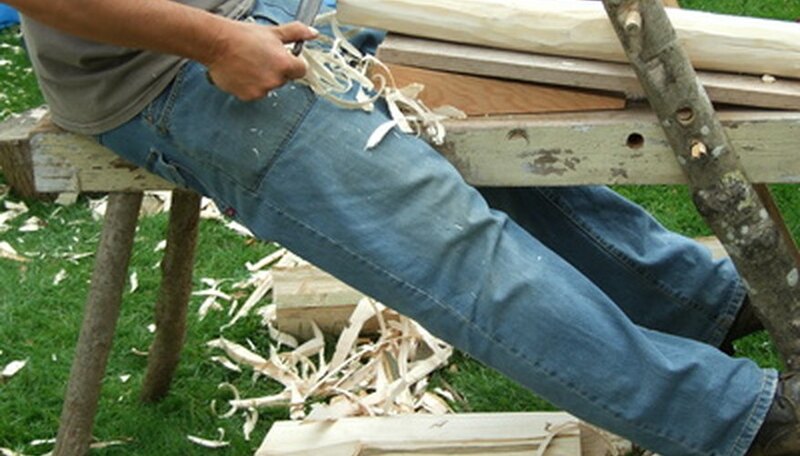 These projects require the use of various saws, sanders, drills, and routers for the woodworker with mid-level skills. Build Eazy (www.buildeazy.com) has patterns for the more advanced woodworker. Projects outlined here are mainly for building functional items, such as fences, tables, dog houses and play houses. These projects require more time, as well as more advanced skills, like lathe, table saw, and jointer skills. Bellany Levine began her professional writing career in 2010. She writes for eHow and Answerbag on topics such as arts and entertainment, literature, television and film. She has also written for student newspapers, literary magazines and blogs. Levine is pursuing her Bachelor of Arts in business from Muhlenberg College in Pennsylvania.